Brightcove was founded in 2004 in Boston by Jeremy Allaire. Now Chief Executive Officer and founder of Bitcoin startup Circle, Allaire remains Brightcove's chairman of the board. The company went public in 2012. Brightcove provides cloud-based services for video content delivery. It sells its services on a subscription basis. Customers include Oracle Corp. (Nasdaq: ORCL), Ford Motor Co. (NYSE: F), and Bank of America Corp. (NYSE: BAC). Brightcove has more than 5,770 customers in more than 70 countries. The company employs about 400 people. BCOV has a market cap of $261 million. 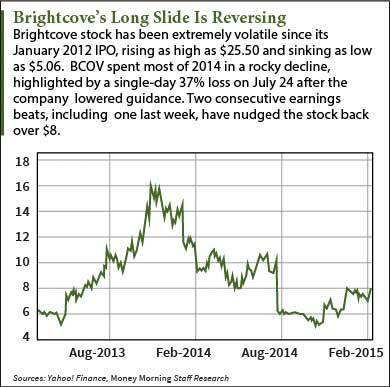 Brightcove stock has had its share of volatility in its three-year history. In the two months following its IPO in January of 2012, BCOV stock more than doubled from its IPO price of $11. It's been on a rollercoaster since. In October of 2013 Brightcove stock rose as high as $16.25 before tumbling again. Wall Street became increasingly skeptical of the company's ability to turn a profit. But in July lower guidance really spooked investors. BCOV stock plunged 37% in one day. A few months later, Brightcove stock was flirting with $5. On Friday Brightcove reported a loss of $0.05 a share, but it was a beat. Wall Street was looking for a loss of $0.08. That positive news has helped BCOV stock to reach $8.15, but it's still down 50% from its highs of late 2013.